Plenty of space for large groups minutes from downtown Coeur dAlene. Whether you have a large party to accommodate or simply want to enjoy sprawling space, Fernan Lake Lodge is the waterfront home for you. From the beautiful granite countertops throughout to the high quality wood and stonework, this home embodies North Idaho vacationing at its finest. You’ll love its location on Fernan Lake, only a 5 minute drive from downtown Coeur d’Alene. When it comes to entertaining, this home has you covered. The fully stocked and stunningly updated kitchen offers seating for 7 around the island and plenty of space for cooking. The kitchen seamlessly flows into an elegant dining room that includes a stonework gas fireplace and seating for 8 at the wooden table. Expansive windows in the adjacent living room create a stunning backdrop of lake and forest views. Between the leather seating and stone wood-burning fireplace, this is sure to be a favorite area to relax between activities. This room offers a laundry room and several doors that open to the upper deck that includes a large table for 8 and a BBQ. You’ll find the master bedroom on the main floor. This luxurious room boasts a king bed, walk-in closet, deck access, and an attached bathroom with double sinks, a spa tub and huge shower. A second bedroom with a queen bed and two additional full bathrooms are also located on this floor. The lower floor has 4 bedrooms with queen beds and another full bathroom—plus a kid’s oasis bunk room that has 2 full beds and a twin! This floor of fun includes a full bar with seating for 7, an adjacent table with seating for 6, a game room with a pool table, and access to the lower deck that’s complete with a hot tub. If you lost count, this home has a grand total of 6 bedrooms, a bunk room, and 4 full (and fully updated) bathrooms—easily accommodating up to 20 people! Each bedroom is complete with top-of-the-line bedding and gorgeous wooden beds. 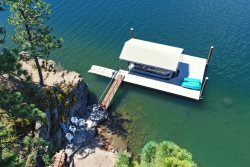 To top it off you’ll enjoy a spectacular location on a peaceful 2 acre lot and access to one of the only private docks on this section of the lake. To access the dock, you do need to cross over a quiet road by foot. In the evenings, you can roast marshmallows around the outdoor fire pit overlooking the lake. Please note that this home is on Fernan Lake and you cannot access Lake Coeur d’Alene from this lake via boat. It is a mere 5 minutes from downtown Coeur d’Alene by car, making it easy to enjoy both lakes during your trip to the scenic Northwest. Everything about Fernan Lake Lodge compliments the luxurious, yet rustic vibe you and your family will love. *This property is on Fernan Lake and swimming, fishing and water activities are not recommended in the months of July and August due to high counts of blue-green algae. Lake Coeur d'Alene is just 5 minutes down the road for these activities. Please check the local area before your arrival. Everyone was friendly and willing to answer many questions regarding the property and amenities in the CDA area. It was a beautiful big home with even more beautiful views of the lake and surrounding mountains. We loved our stay, it was the perfect home for our get away. Thank you! the Vacation Rental Authority team was great. Very helpful and friendly! There was a problem with our original booking. Nicole Ziegler was able to find us another location that suited our needs. She was very professional & helpful. We stayed in the home in November so it was a little cool to enjoy the lake or out doors. The property was very nice. Seven adult women enjoyed our stay in the home & area. Great home!! Perfect location!! No towels in downstairs bath. Other than that we absolutely loved it!